The new Keeley Compressor Plus is the result of us specializing in compressors for over 15 years. Chief Engineer and founder Robert Keeley said, “Compression was the first effect I found that was hard to make sound good off the shelf, so I set out to create the best sounding compression effect possible.”. 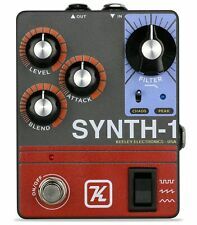 New Keeley Synth-1 Reverse Attack Fuzz Wave Generator Guitar Effects Pedal! Think of it as very affordable studio-grade compressor in stomp box format! Therefore they are directly suited to bass guitars. The Keeley Bassist Compressor is both musical and very transparent. Not only can the Keeley Bassist handle astonishingly large signals, it has an incredible bandwidth of over 20 KHz and incredibly low noise. All 41,000 of our Keeley 4 Knob Compressors have been hand built in the USA. The Keeley Compressor was given the Editor’s Pick Award from Guitar Player’s Magazine and recently awarded Reader’s Choice for Stomp Box. The Keeley Mod Plus was born. Keeley Baby Red Dirt – Mini Pedal. Keeley Red Dirt Mini Pedal. In fact the mod was crafted so well that it didn’t change one bit in nearly 14 years. It is essentially all of the Keeley mods wrapped into one pedal. The Keeley Aria Compressor Drive, The Ultimate Compressor and Overdrive Experience. Compression and Overdrive are the foundation of my engineering. Players also have the ability to swap the order of the compressor and drive for two very useful drive experiences. Keeley Electronics Compressor Pro. Keeley Compressor Pro. The stomp-box sized compressor/limiter is hand made in Oklahoma, USA and engineered to be an indispensable tool to your musical endeavors. It is in no way limited to be used with only guitar. Used Keeley Tone Workstation Effects Pedal. The Keeley team of engineers and designers have upgraded the tone, enhanced the features, and reduced the size to now fit on anyone’s board. The 2016 Keeley Tone Workstation. We know how to make your guitar jump from the mix. We know how to make it fun and easy to play. Keeley Compression is how. The new features are simple and straight forward. Now there is a simple Release Switch that is tuned for single coils or humbuckers. Before drives gives you a consistent gain level. Problem solved! Now, these two epic tones are together in one stomp box that is easy to use and full of features. Insert effects between the two sides! All of Keeley’s Compressors are made in the USA. The Keeley Compressor was given the Editor’s Pick Award from Guitar Player’s Magazine and has won many more awards in it’s 14 years in production. The sound alone will inspire your creativity. Next up is the 1962/Katana Boost section, because the Keeley Workstation gives you plenty of options for your core tone. With the 62/Katana channel, you can select a sound with just the right amount of break up. The Keeley team of engineers and designers have upgraded the tone, enhanced the features, and reduced the size to now fit on anyone’s board. The 2016 Keeley Tone Workstation. Next up is the 1962/Katana Boost section, because the Keeley Workstation gives you plenty of options for your core tone. In live situations, the Compressor Pro can be used to achieve full sounding, polished performances as well as protect amplifiers and speakers from overload. Use it when creating a podcast or YouTube videos to maintain professional performance levels. 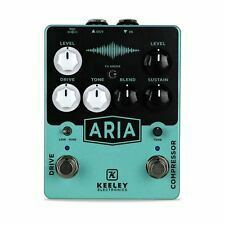 New Keeley Aria Compressor Drive Guitar Effects Pedal! New Keeley Aria Effects Pedal. The Keeley Aria Compressor Drive, The Ultimate Compressor and Overdrive Experience. Compression and Overdrive are the foundation of my engineering. They are also essentials for live guitar performance. Effect switching incorporates a triple pole-double throw switch! You will have clean unaffected sound when in the bypass mode and an LED for effect indication. Hand matched transistors to less than 1% tolerance ensures you get a perfectly compressed signal, no chance for unwanted distortions. Works fine. Hint - weekends are the buying period. Also, if you really really want it, might not want to wait to pull the trigger! I am a pedal freak, thus I buy and try, and pass along the goodies that I can’t keep. 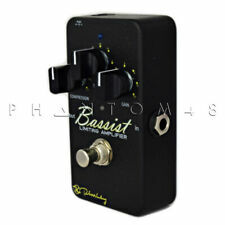 Think of it as very musical studio-grade compressor in stomp box format! The Keeley GC-2 Limiting Amplifier is both musical and very transparent. Not only can it handle astonishingly large signals, it has an incredible bandwidth of over 20 KHz. 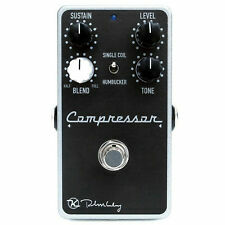 Think of it as very musical studio-grade compressor in stomp box format! The Keeley GC-2 Limiting Amplifier is both musical and transparent. Not only can it handle astonishingly large signals, but it has an incredible bandwidth of over 20 KHz. New Keeley Compressor Pro Guitar Effects Pedal! The Keeley Aria Compressor Drive, The Ultimate Compressor and Overdrive Experience. Compression and Overdrive are the foundation of my engineering. before drives gives you a consistent gain level. Problem solved! Dialed in to give you the punch and clarity of a horn yet subtle and smooth in saturation to give you warm overdrive and tons of sustain. Expect it to work well with any amp or rig. No longer will you wonder what the perfect clean boost should be. Keeley Aria Compressor Overdrive Pedal Brand New from AUTHORIZED Keeley Dealer! Compression and Overdrive are the foundation of my engineering. before drives gives you a consistent gain level. Problem solved! Now, these two epic tones are together in one stomp box that is easy to use and full of features. The Keeley Compressor Plus is a compressor with an expander/sustainer. Not only does it act as a regular compressor, limiting the peaks in your playing, it adds more and more gain as notes fade out. KEELEY C4 COMPRESSOR IN EXCELLENT USED CONDITION AND FULL WORKING ORDER. Be heard and felt using performance compression by Keeley Engineering. Bassist Compressor and Limiting Amplifier. Once you have learned your new Comp Prothere will never be a reason not to use it. In live situations, the Compressor Pro can be used to achieve fullsounding, polished performances as well as protect amplifiers andspeakers from overload. Think of it as very affordable studio-grade compressor in stomp box format! Therefore they are directly suited to bass guitars. The Keeley Bassist Limiter/Compressor is both musical and very transparent. It all culminates in an overdrive that is superbly dynamic, with crispness and clarity that let players cut through a dense mix, while retaining the plump midrange. The Red Dirt Overdrive is why people have been screaming, “Robert Keeley, the mod god! Be heard and felt using performance compression by Keeley Engineering. Think of it as very affordable studio-grade dbx compressor in stomp box format! Therefore they are directly suited to bass guitars. Maker: Keeley Electronics. Keeley Compressor Pro. The stomp-box sized compressor/limiter is hand made in Oklahoma, USA and engineered to be an indispensable tool to your musical endeavors. It is in no way limited to be used with only guitar. Der Keeley Compresssor GC 2 Limiting Amplifier bietet echte Hi-Fi Kompression und Limiting. Gebaut rund um den exotischen THAT Corp. 4320 ist er ein sehr musikalischer Kompressor auf Studioqualität im Stompboxformat! Pédale COMPRESSOR PLUS. noir et gris. consommation 10mA. Sieh ihn als sehr leistbaren Kompressor mit Studioqualität im Bodentreterformat! Deswegen eignen sie sich speziell für E-Bässe. Der Keeley Bassist Compressor ist musikalisch und transparent. Nicht nur kann er erstaunlich starke Signale verarbeiten, er hat eine unglaubliche Bandbreite von über 20 KHz und ist extrem rauscharm.